Home » PMP Resources » How PMP® Certification Can Enhance Your Career? This is a frequently asked question. Sure PMP® is one of the most respected Certifications globally in Project Management but, given that it takes quite some effort, is it worth pursuing? Well, it really depends. Many factors such as your profile, current role, career ambition, scope within your current employer etc., may influence its worthiness. I strongly believe that Professional Certifications is very helpful in career growth. With current competition in the job market, certification such as PMP® is definitely invaluable in providing distinctive advantage. PMP® Credential benefits you broadly in 4 areas: Enhances Skills, Better Career, Networking Opportunities, and Identity. PMP® is a test of your knowledge of PMBOK, Project Management Book of Knowledge, which is PMI’s (Project Management Institute) best practice publication of project management practices across the globe. Pursuing PMP® imparts knowledge to enable you to become a better project manager and, there by, increase success rate of your projects. It also exposes you to mainstream thinking and current trends in project management domain. With my experience in project management practice, I can confidently say that PMP® will be a jewel on your resume and definitely boost your career prospects. Ever increasing competition in the global job markets, PMP® certification will give you the edge you need to pursue your dream career in project management. PMP® has international reputation with currently about 660,000 certified PMP® professionals across 200+ countries. This certification can give you a ticket to pursue global opportunities. Also, PMP® can get your a better salary. According to a recent study on pay scale “Project Management Salary Survey — 8th Edition”, on an average, PMP® Certified project managers earn 17% more salaries when compared with non-certified peers. Employers immensely benefit from PMP® certified professionals on their work force as a quality organisation and gain significant credibility in delivering project on time with agreed requirements. This enables in winning more business making your more valuable to the company. PMI has 274 chartered chapters across 204 countries as date. With a nominal annual membership fee, about USD 10, you get access to wide network of project management professionals through events and conferences organized by chapters, providing you a great networking opportunity. Your professional network is also extended through networking other PMPs . Also, you could actively participate in training and mentoring PMP® aspirants, increasing your reach and bound. A PMP® Certification is a formal display of your project management ability and your experience. 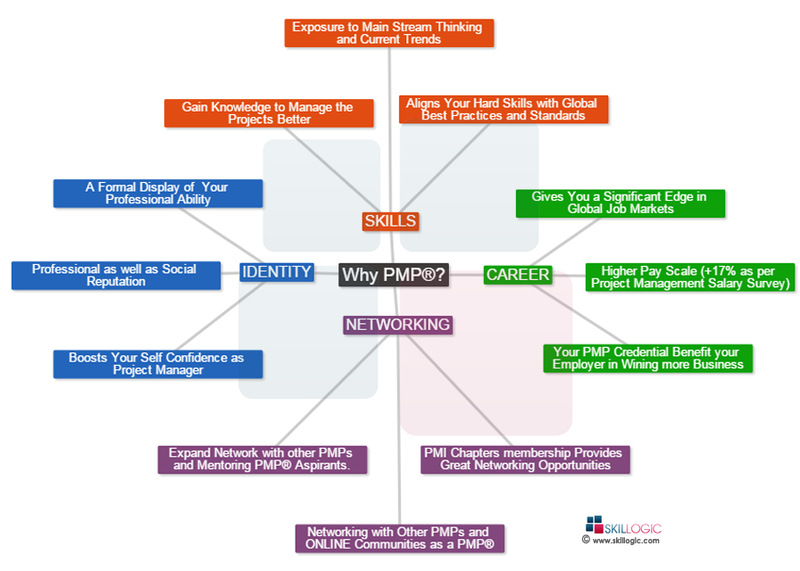 A PMP® is well respected in project management community as well as in social context. This boosts your self confidence and could get you to next level in your career path. Ok, so what is stopping you from becoming PMP? Well, in spite of being expensive, PMP® is known to be a tough nut to crack. With, say 10-15 years of experience, most professionals will be hesitant to take a failure in a test as that would harm their professional reputation. The question is, can I crack PMP® in first attempt? Follow this sequel blog on how to crack PMP in first attempt. Skillogic Knowledge Solutions is one of the prominent centre for PMP Training in India. Skillogic is having classroom training for PMP in Bangalore, Chennai, Hyderabad, Mumbai, Delhi and Pune. Hello, I have 2 years of Software Support experience, will PMP or CAPM help me in any manner ? Also, please suggest me any other certification that is relevant to me. @Jaskiran Singh – PMP requires 4500 hrs of managerial role experience in Projects and CAPM requires 1500 hrs of Project experience as pre-requisite. Support Experience is considered as Operations , not as Project. You may need to gain the required experience and then attempt to apply for these Certifications. PMP is one of the most popular certification for Project Managements and other being PRINCE2, so it definitely help you to gain more knowledge, as well as enhance your career propects. Hello, I have 3.9 Year experience in software supporting and Project tracking, Will PMP certification help me to enroll? What is diff b/w PMP & PMO? I have 2 years experience in recruitment. Is this course help me in changing career in next level.. I having +5 year of experience of telecommunication field in project coordination and team management. Pls suggest me for this course ? Can I opt for PMP after completing My 12th boards.. I have 7 years of experience in Quality Assurance [ QA Consulting]. Let me know if PMP or Prince 2 certification is beneficial ? I have been into Software programming for 3.10 years. Can i attempt for CAMP certification? Hi Priya,if you have 5 years of projects related experience in quality assurance, I suggest to go for PMP. Zuby, You need 5 years of PM experience. I suggest you look at PRINCE foundation if you want to mold your career in project management. Ravikanth – I suggest PMP. Please call 180 200 9030 for more details on batches. Why PMP Certification is required anyway? PMP Certification – Is It Really Worth For An IT Professional?